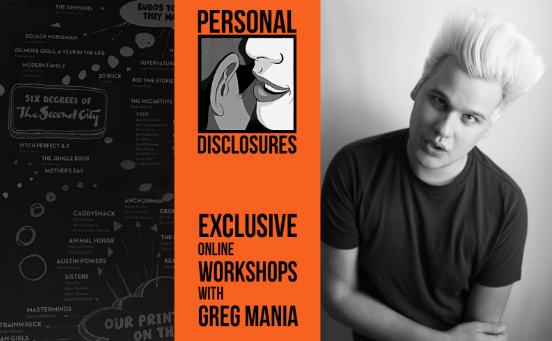 Greg Mania, MA Media Studies ’17, is taking his talents to the classroom in a series of online writing workshops for Personal Disclosures – beginning October 1 and running for a total of six weeks – as a guest faculty member, alongside writers like Roxane Gay and Chloe Caldwell. The workshops, sponsored by Second City, are capped at ten students and follow different themes each week. Mania hopes to serve as a mirror for his students, where their reflections challenge them to look inward and hone their voice. “In today’s sociopolitical climate, where the personal is political and the political is personal, there are voices that are actively being silenced,” Mania says. “I’m here to remind that your voice is important, your story has value, and that you matter despite (and in spite of) the stringent efforts being made by those who are fervent to uphold their idea of a status quo.” Students of these workshops will read each other’s work and provide feedback once a week during three-hour classes. Mania’s penchant for teaching began as a TA for Christina Kallas’ screenwriting class while at The New School. “I ended up really loving the symbiotic relationship between the students and myself,” Mania says. It’s this dynamic he aims to continue in his workshop. Since he graduated, Mania has been balancing various creative endeavors. Currently, he writes a satirical column for OUT, contributes pieces for PAPER, and is shopping around a book project and a pilot, the latter having been named the Overall Winner of the Filmmatic Screenplay Awards.